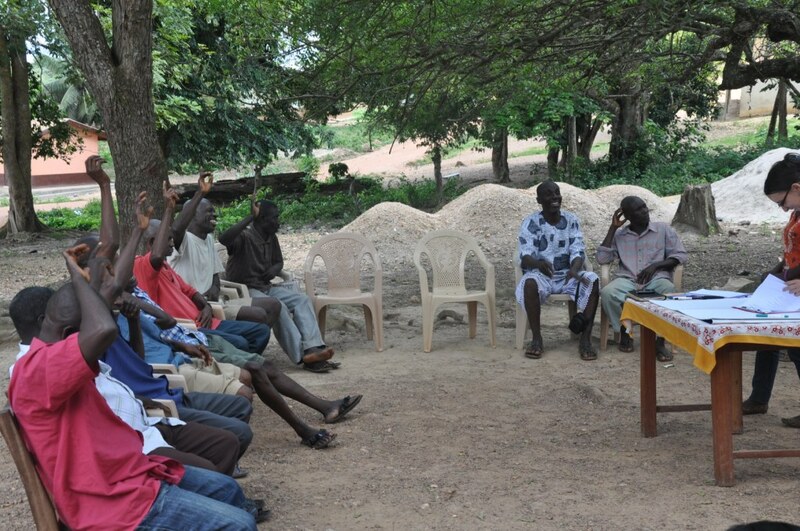 Similarly to the discussion at the Adwoa (anonymized) community, the discussion at the Kwadwo (anonymized) community was organized with the help of extension officers from the district office. 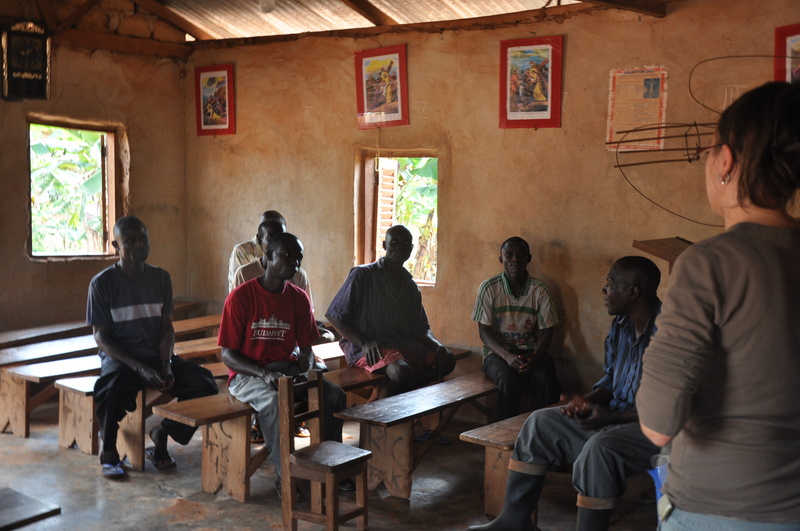 The setting selected for the meeting was a local church, which induced a more formal atmosphere into the interactions. The discussion started by considering recent developments and participants recounted that they did not have electricity until 2008. Nonetheless, as the community has had a surfaced road, its population increased considerably. Immigration into the community was largely due to surface mining activities which take place in the area. Farmers estimated that more than 30 tro-tros (i.e. public mini-buses) visit the community each day. Despite the high level of traffic, there was no newspaper delivery, nor sales in the area. The most memorable adverse event in recent years was the famine of 1983, when many cocoa farms were burnt as a result of the hot weather and absence of rain. Nonetheless, the farms were re-established after the famine was over. In recent years, improved efforts by the public extension office helped improve farmers’ yields. among the remaining problems was black pod disease which still affected yields and the affordability of fungicide in order to control the disease. Out of the 13 farmers at the meeting, 9 had access to radios, and they could list more than 20 radio stations which could be received in the area. Farmers tended to use their radios in order to listen to the news. Five out of 13 people in the focus group said they owned television sets but they also said tv signals are not the best. They had access to 4 TV channels: GTV, Metro TV, TV Africa and TV 3. The community had a school but no library. The community had 1 mosque and “uncountable” number of churches. The locations of 4 churches were marked on the participatory map. The loudspeaker in the community was known as an ‘information center’, and it served for making announcements about community labour, farmer meetings, funerals and local other information. The fee for announcements (GhC 1) included the announcement being aired twice. Farmers remarked that loudspeakers were often used by salesmen, traveling by car, in order to promote their merchandise (e.g. medicines). The community had no town crier. Mobile phones were not too common among the farmers in the meeting and only 4 indicated that they own cell phones; out of them had devices with radio functionality. Those who did not own mobile phones made calls from the shared ‘space-to-space’ facilities. These are fixed mobile phone facilities operated by salesmen of mobile credit vouchers. 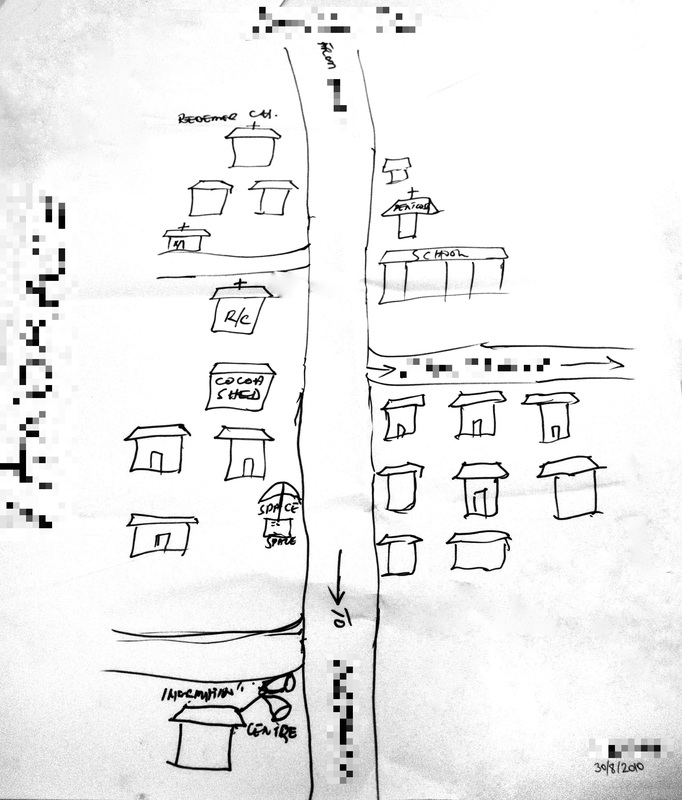 Their location is marked on the map with an umbrella, as they are also known as “umbrella salesmen”. 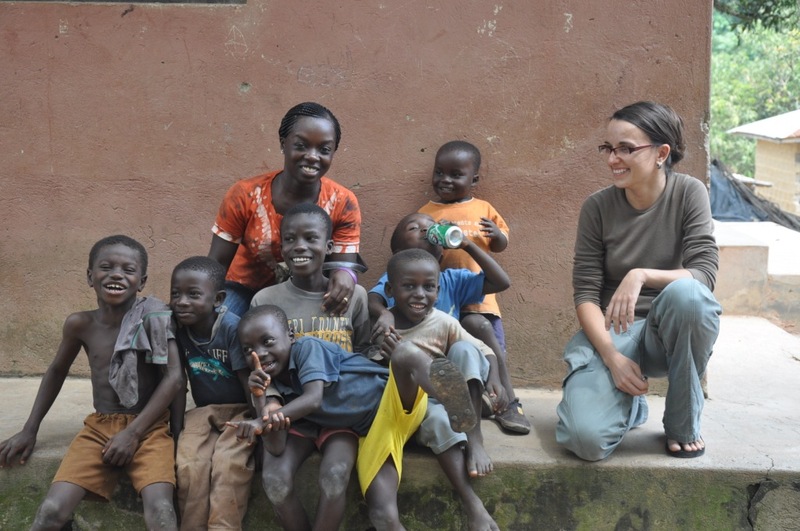 In the next few posts, I would like to present some findings on the information ecology of rural Ghana, from fieldwork I conducted back in June- September 2010 as IFPRI research fellow. 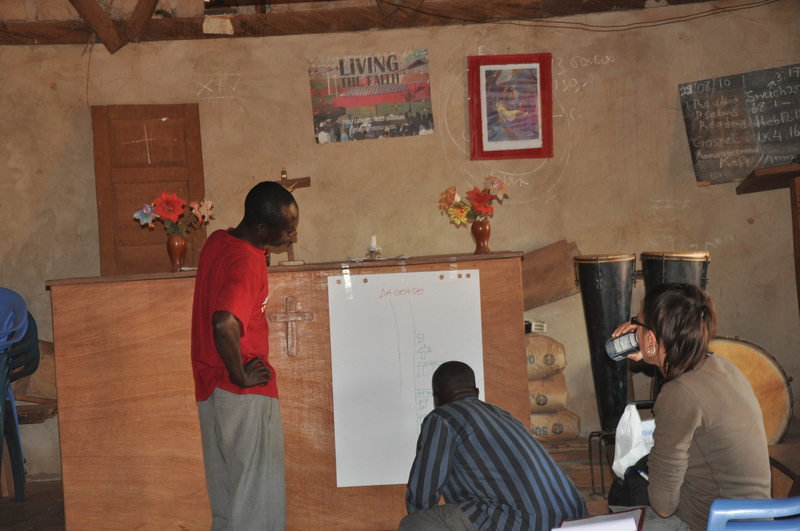 A total of 7 focus group discussions were carried out, following participatory rural communication appraisal methods (Mefalopulos, P., & Kamlongera, C. 2004). The focus groups lasted approximately 2 hours and were typically held in community locations such as churches, schools or other central areas. The table below describes the sampled (anonymous) sites in terms of complementary infrastructure such as motorable roads and electricity; as well as, the number of male and female participants in each group. The field trip was carried out by myself, my research assistant Marian Asamoa and our driver Alfred. 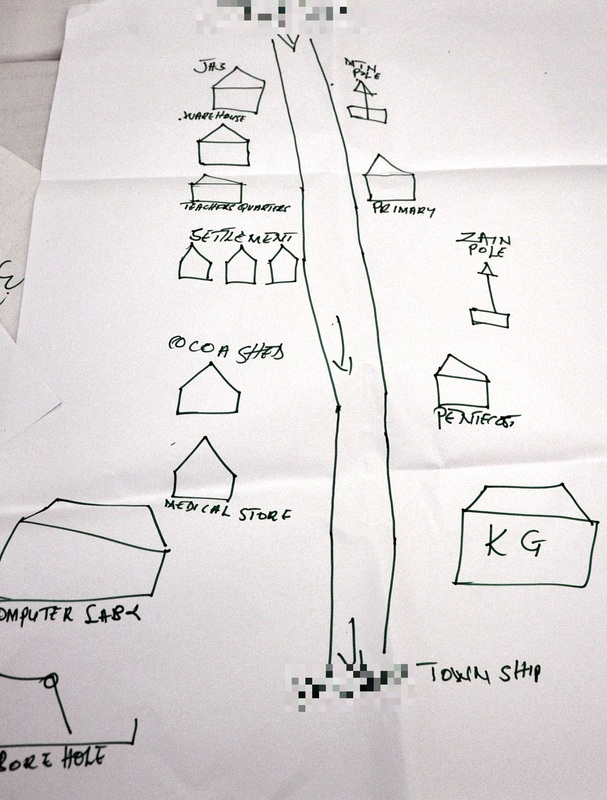 We conducted semi-structured discussions of information channels and farming practices, which allowed us to document an ecology of agricultural information channels. The exercises completed by tge groups involved the ‘human web’ (a method emphasizing relationships within the group and interdependencies within the community), participatory mapping of information resources, and ‘problem tree’ discussion of productivity gaps (a method for revealing perceived problems). The next few posts will include material from those discussions. In reporting from the ICT4Ag conference in Kigali, Rwanda, IT News Africa features the following apps as the best for agriculture in Africa. Consider the descriptions provided by IT News Africa, as well as short comments I offer. Please cast YOUR VOTE! The iCow platform has a series of dairy agri products that are available over a simple menu system. Farmers dial a short code, *285#, and access a simple menu that guides them on how to subscribe to the various products. 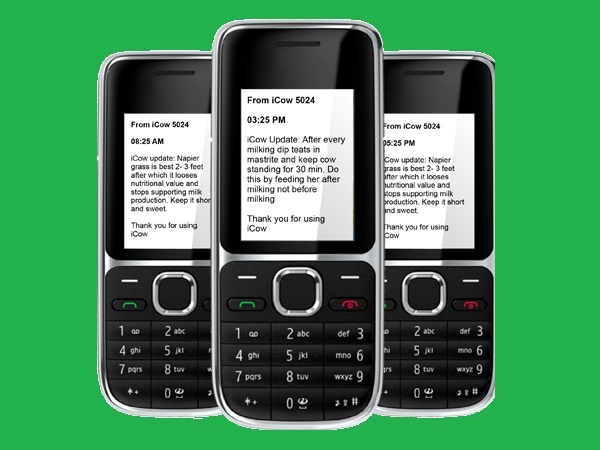 After subscribing, the system sends messages to users at intervals – depending on the product choice. iCow’s objective is to increase farmer productivity through access to knowledge and experts and to encourage the development of a younger generation of farmers. >>I understand that iCow’s content products are advisories. From my work with extension agents in Ghana, I am largely skeptical of SMS messages being able to convey the complexity of agriculture advisories. Developed for rural Africa, Rural eMarket is a simple yet powerful solution to communicate market information, using smartphones, tablets or computers. Rural eMarket is multi-lingual, easy, quick to adopt, and most of all, affordable for most rural projects. The use of appropriate ICT solutions can improve transparency and access to market information and transform the livelihoods of rural populations. However, there are many regions in Africa that do not benefit from these new technologies because of illiteracy, the weakness of connectivity or the inability to find an affordable and adapted solution. >>The concept of using mobile for improving the transparency of agricultural value chains in Africa is not new. In fact it is what inspired me to start this blog years ago. Yet, I think it remains very ambitious goal to realize by offering content services for farmers at the retail level. The structural constraints to trade, other than information, remain the limiting factor! mFisheries is a suite of open-source mobile and web applications for small scale fisheries. It was developed at the University of the West Indies with International Development Research Centre (IDRC) support and comprises a virtual marketplace application, which displays market prices using open data. There is also the ‘Got Fish Need Fish application’ which, in real time, connects agents in the fisheries value chain. It includes navigational tools such as a compass and a GPS logging and retrieval application, as well as training companions including abbreviated first aid lessons from courses delivered by the Caribbean Fisheries Training and Development Institute. >>Achieving an efficient market in the fisheries remains a case with promise, since early efforts by Manobi in Senegal and Jensen’s pioneering work on “The Digital Provide: Information (Technology), Market Performance, and Welfare in the South Indian Fisheries Sector”. Fish is highly perishable with volatile market value and fishermen are largely flexible in terms of where they market their catch. This application does sound promising to me. Esoko is Africa’s most popular mAgric platform for tracking and sharing market intelligence. “We have a range of apps that you can choose from to suit your needs,” they state. It links farmers to markets with automatic market prices and offers from buyers, disseminate personalised extension messages based on crop & location, and manages extension officers and lead farmers with SMS messaging. Esoko is a totally customisable comprehensive platform designed to transform how you manage your information needs – all bundled into one easy-to-use interface, and backed up with a unique deployment team to help you anywhere. >> I have spent a lot of time with Esoko in Ghana. I think they are moving in the right direction towards developing a sustainable B2B2C business model. Synthesizing IT development knowledge, agronomic and business knowledge they work with wholesale clients while maintaining some retail content offerings. The FarmerConnect Platform is a cloud-based and mobile-enabled platform that delivers personalised agricultural extension services and text/audio information intelligence in local languages to smallholders and farmers who otherwise do not have access to- or can comprehend information from traditional sources. 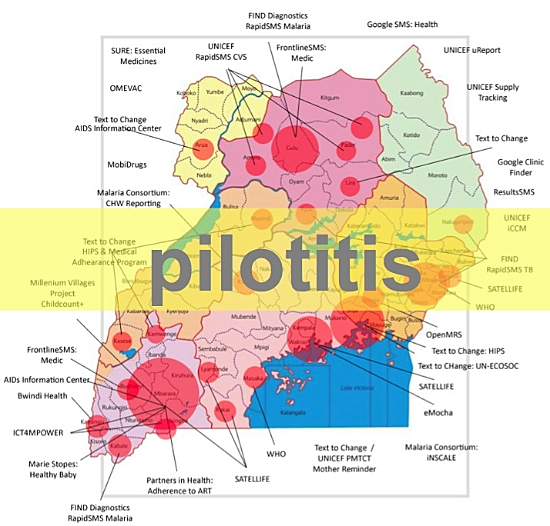 Such service helps them stay connected with the information and aiding agencies on a daily basis, increase their yields/incomes, and reduce hunger, poverty and under-nutrition. FarmerConnect, in a nutshell, hosts a one-stop market place for agricultural communities, including service seekers (Farmers), service enablers (Government, NGO and Private agencies) and service providers (Agronomists, Markets Trackers, Weather Stations etc.). >>It appears to me that leveraging the mobile cloud for the delivery of media rich advisory services is a promising approach to raising agricultural productivity. Yet, only focusing on disembodied knowledge can be problematic. Advice, without human contact and without knowledge inputs e.g. fertilizers, technologies, etc. rarely delivers impact. M-Shamba is an interactive platform that provides information to farmers through the use of a mobile phone. M-shamba utilises the various features of a mobile phone, including cross-platform applications accessible in both smart and low-end phones, and SMS to provide information on production, harvesting, marketing, credit, weather and climate. It provides customised information to farmers based on their location and crop/animal preference. Farmers can also share information on various topics with each other. M-shamba is currently being used by 4000 rice farmers in Kenya to help them adopt new technologies in rice farming. >> I appreciate that this app offers social networking and knowledge exchange functionalities. I think it is a mandatory aspect of a working solution for rural Africa. Applications which do not harness the strength of rural information networks are missing the point. Mobile Agribiz (mogribu.com) is a web and SMS mobile application that helps farmers decide when and how to plant crops, select the best crops for a given location using climate and weather data, and connect to the available market. It helps connect farmers to buyers, and helps them to source important, relevant information (e.g. how to plant crops, how to use fertilizers) and necessary data aggregates (e.g. weather, crop pricing) from various sources. Farmers can easily connect with customers by sending an SMS with their phone number, information on goods, prices and quantities fort sale. This information is plotted into a map on servers, enabling customers to see farmers’ information, the goods they are selling, their quantities and location, and make a connection. AgroSim is a valuable tool for decision-making in agricultural projects. It works primarily on data collected online and provides a virtual representation of the different stages of crop growth and development as would be the case in reality. It is an event simulator able to anticipate the quality and quantity of the productivity of a desired crop by taking into account data related to seed, soil, hydraulic climate, geography, macro-economy and the demographic of the targeted area. Created to be used on all platforms (locally, online, on Smartphone and Android) and built with artificial intelligence to cater for the increasingly demanding needs of this industry, Agrosim is an adaptable and portable application which is universally used by both novices and professionals in the agricultural sector. >>I am sorry to say so, but I think that a traditional decision-support system is largely inadequate for responding to the needs and capacities of African smallholders. Developed by Access.mobile, amAgriculture is an analytical tool that helps agri-businesses understand underlying business trends, manage transactions, cut costs, increase revenues and mitigate risk. Core product features include agricultural input data collection and management; agricultural output data collection and management; transactional data tracking from agent transactions with farmers in cooperatives/network; web-based and mobile analytics; web-based push/pull SMS system for agents and farmer communication; and data export capabilities in Microsoft Excel. Farming Instructor is a mobile app that provides online and offline agricultural information (text, speeches and animations) to farmers and their communities. The application is created specifically to inspire youth and all other groups in the society to have the passion to engage in agriculture as the means to self-employment. With this app, the user or farmer can source all the necessary information related to agriculture, as well as share and comment on other farming tips and advice.